All commercial buildings including restaurants, store fronts, offices, hospitals and schools are legally required to have properly installed and working emergency exit devices – a.k.a. “crash bars”. Emergency exit function is a serious life safety matter and should be treated with the utmost care and highest priority. There are federal and state laws with specific guidelines regarding emergency exit devices which the professional locksmiths at Locks & More are formally trained on every year. Tom Wells, a licensed MA Construction Supervisor and fully trained locksmith, will ensure that your business satisfies code requirements. Peace of mind comes with knowing you have enabled a speedy and safe exit from your building in the event of a fire or other emergency. Call Locks & More today to discuss your specific needs. At Locks & More we employ formally trained, hands-on locksmiths with working knowledge regarding the newest federal and state ADA and life safety codes for your business. We will never sell you more than you need or leave your business vulnerable to code violations. We use only the best products and equipment on the market today. As the world goes key-less, so can your home or business. 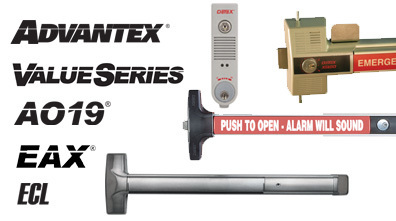 Locks & More can install and maintain a push-button, key-less entry lock for you. ◾Assign an individual pin code for every authorized usera text box a settings menu will appear. High security locks come in all different levels of security from restricted key duplication to pick and drill resistant locks to the overall lock construction. Property management companies want to restrict the tenant’s ability to duplicate the keys on apartment complex entrance-ways to control who has access to the property. When a business owner gives a key to an employee, they want to be certain no one is able to copy it. Do not be fooled by keys which are simply stamped “Do Not Duplicate” - only a few brands of keys and locks can truly not be duplicated without signed, authorized, written permission. Locks & More sells Medeco, MX8, and several other high security locking systems for your home, apartment complex or business.